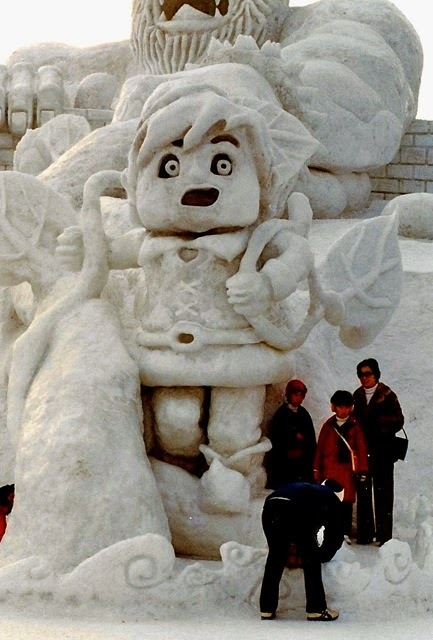 It was fun roaming around these giant snow sculptures. I can only imagine how much fun it was to carve them. Other posts about Sapporo and the Snow Festival can be seen here. The group coordinator asked for two substitute knitters on Snowflake, so Cheryl and I volunteered. 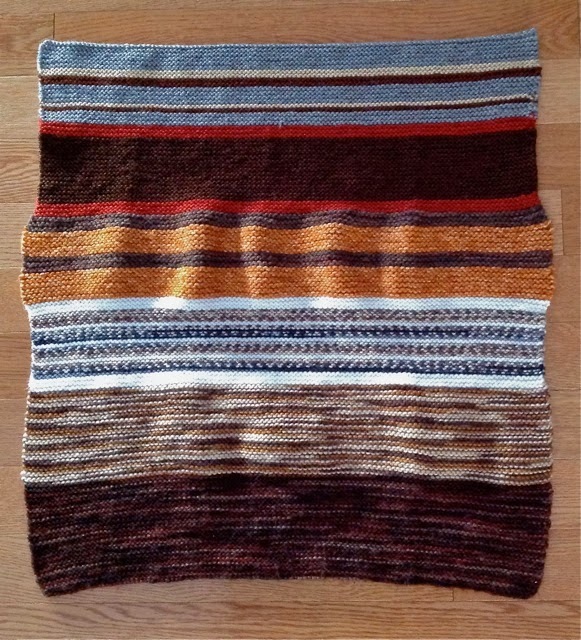 I knit the second section on this blanket in December and added the second to the last section in January. 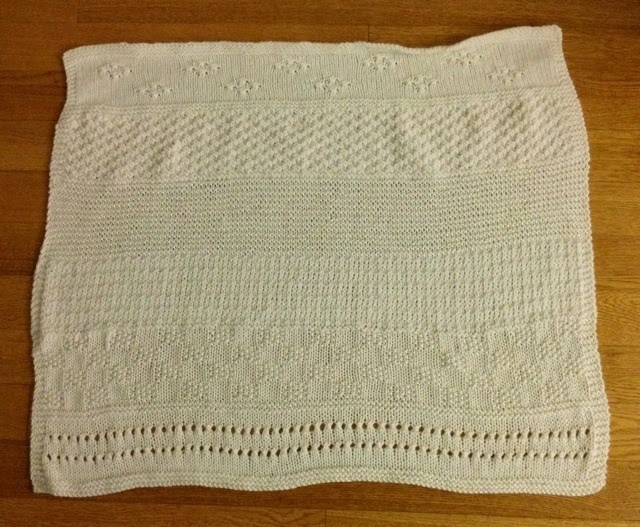 My second section was knit with Caron Simply Soft (white), using a seed stitch and stockinette block pattern. I used a new skein of yarn and discovered that the yarn coming from the center of the skein had grease and guck on the strands. Cheryl gave me the blanket when she finished her section, so I could use some laundry pre-soak on those sections. I washed the blanket, and thankfully, all the stains came out. 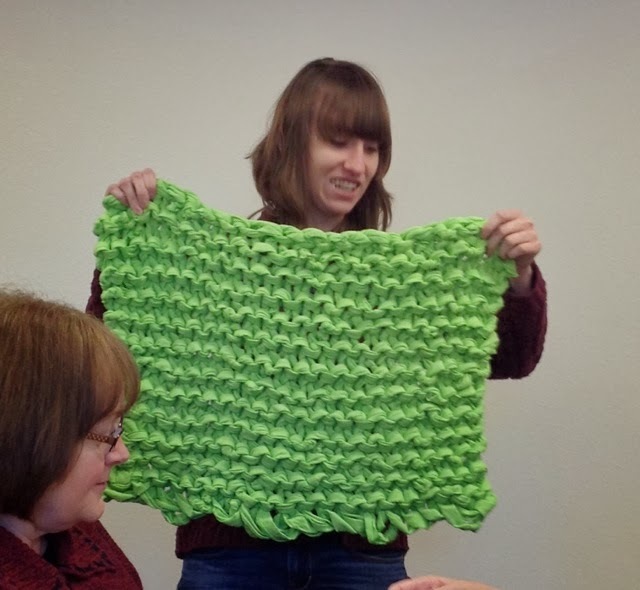 Cheryl knit the last section, shown at the bottom of this photo, and did the bind off. She will start a new blanket on the empty needles. Shortly before Christmas, I was given a grocery bag with some old family negatives - photos taken with a Brownie camera. The negatives were in old photo mailers and were in a box purchased at my brother's estate farm auction in 1997 or 1998. I was thrilled to have the 142 negatives returned to my family and thank the two women (Pam G. and Nancy Kay) who played a role in their return. Pam could have easily destroyed the negatives, but instead, she found a way to return them to the family. Thank you, Pam! As a surprise for my sisters, I took the negatives to Walgreens to be scanned and burned on DVDs. The clarity of the old negatives is amazing. All of the photos were taken before I was born; however, I know the story behind some of them. My Mom and Dad came to Wyoming (from South Dakota) with my dad's brother Ted. Mom and Dad lived with Ted and his wife for a few years before purchasing a farm of their own. 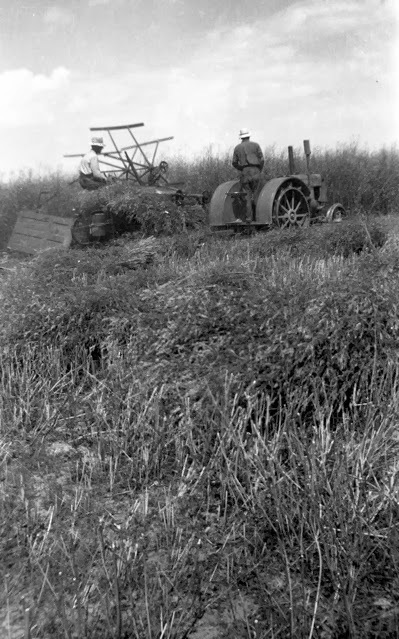 The photo shown above was taken on Ted's farm during that time. In coming weeks, I will be posting the old photos and sharing as much of their history as I can. Hopefully, my sisters will help me fill in the blanks. I meant to prepare this post for a couple of years, but I kept forgetting. 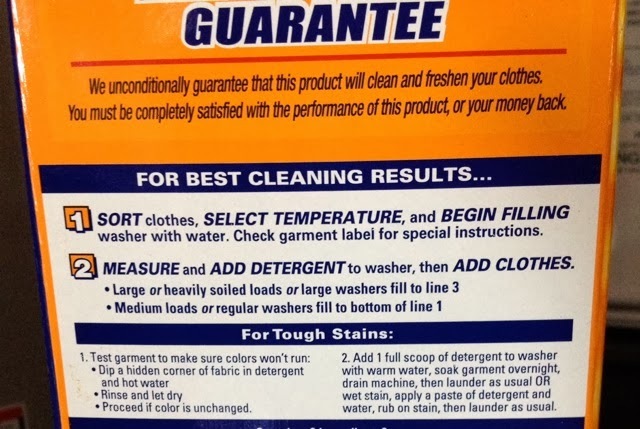 So, the title fits on two fronts: what took me so long to post and what took me so long to actually read the label on my laundry soap. 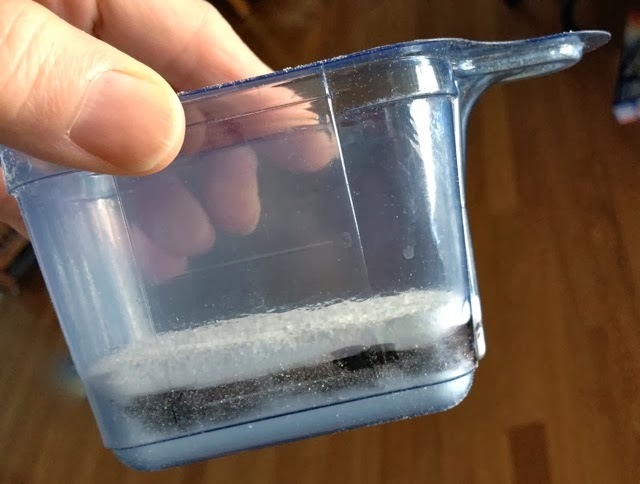 A couple of years ago, I made a batch of laundry soap using this recipe and that is when I noticed the error of my ways. For the first time I saw the lines on the handy scoop - lines for 1, 2, and 3, and that's when I read the label on the soap box. Clearly, I had been using waaaaaay too much laundry soap and had been for years. I used a marker to remind myself to use less soap. It's amazing how long a box of laundry soap lasts now, and my clothes are just as clean. 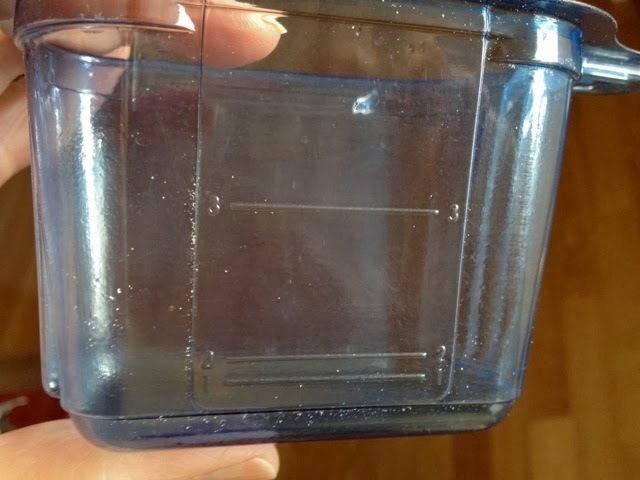 Have you read the label on your laundry soap - powder or liquid? You, too, might be surprised. This woman was clever to take a sled to the Sapporo Snow Festival grounds because it was a large area and required a lot of walking. 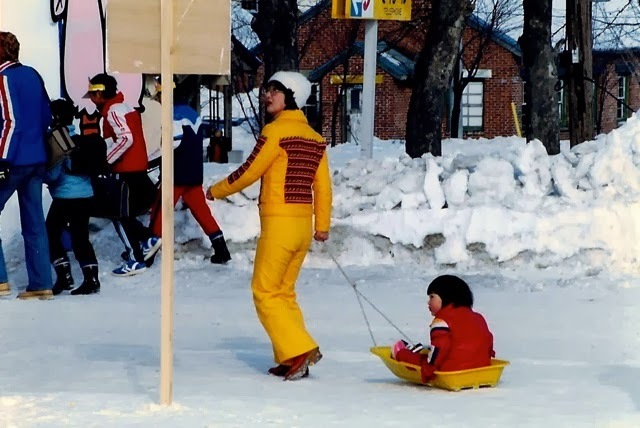 Her daughter was having fun being pulled around, and the mother was able to cover the area quickly. We saw a lot of children on the grounds but not many sleds. Obviously, this wasn't the mother's first "rodeo," and she came prepared. Perspective and attitude play huge roles in our daily lives. 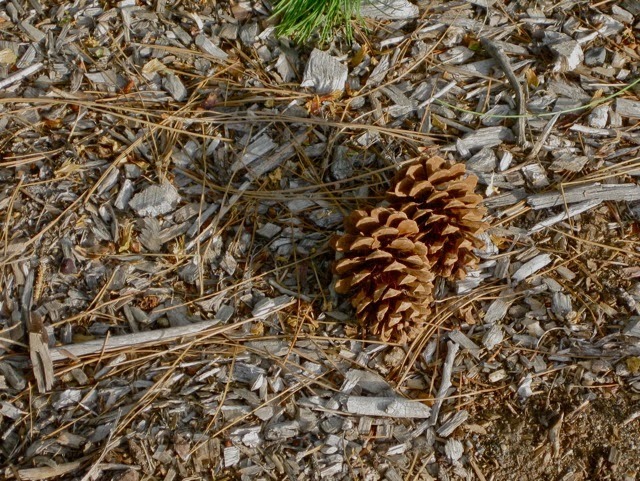 In the photo above, some may see beauty; others, litter. By perceiving only the negative in our surroundings and life, we push aside the beauty in the ordinary: we push aside the joy in simple things. By embracing an attitude of gratitude, we soon notice more and more positive things around us, and the negative things and thoughts recede into the blackness from which they crawl and hide. Our attitude plays a huge role on our health, longevity, and quality of life. Don't believe me? Check out this article from the Mayo Clinic or this article on the Benefits of Positive Thinking. "The longer I live, the more I realize the impact of attitude on life. Attitude, to me, is more important than the facts. It is more important than the past, than education, than money, than circumstances, than failures, than successes, than what other people think or say or do. It is more important than appearance, giftedness, or skill. It will make or break a company. . .a church. . .a home. The remarkable thing is we have a choice every day regarding the attitude we will embrace for that day. We cannot change our pasts, we cannot change the fact that people will act in a certain way. We cannot change the inevitable. The only thing we can do is play on the one string we have, and that is our attitude. What's your perspective of positive thinking and a positive attitude? 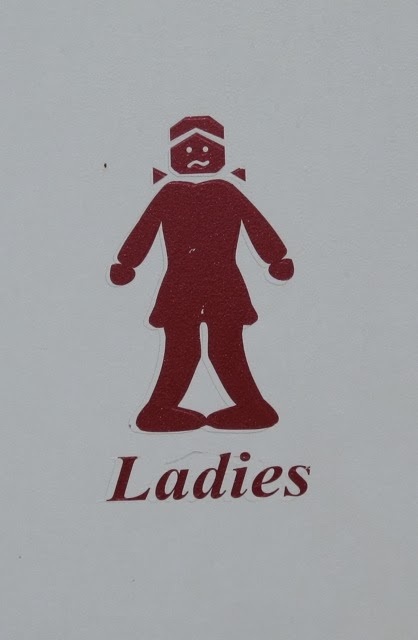 Restrooms are often labeled with alternative names for Women and Men, which can sometimes be confusing. The signs we saw at a convenience store on the way to Reno, Nevada were clear and humorous for both the Ladies and Gentlemen's rooms. 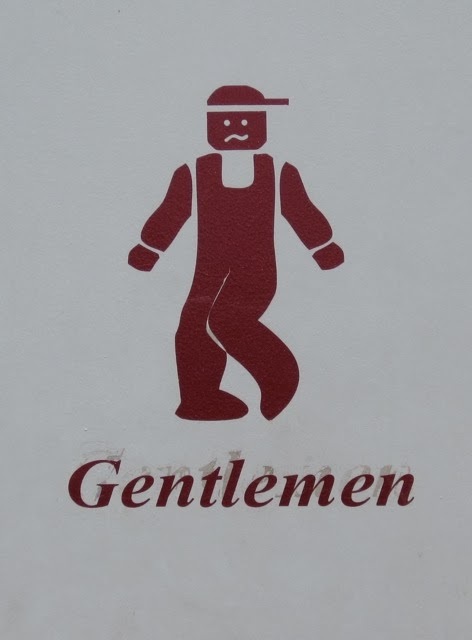 Have you seen any clever signs for bathrooms on your travels? Pattern details are on this post. 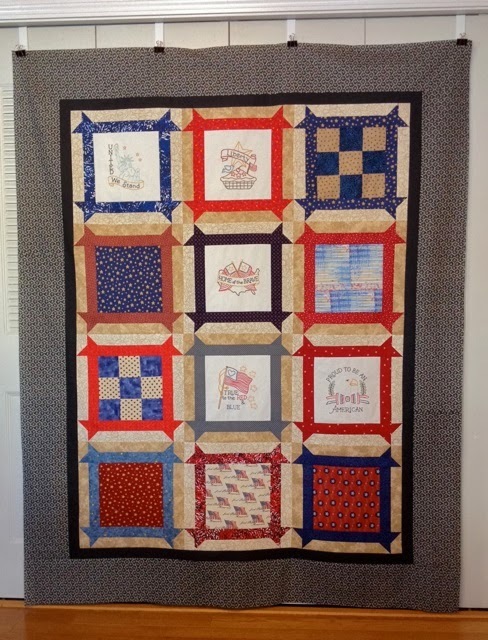 This quilt was presented to a veteran on Veteran's Day 2014. 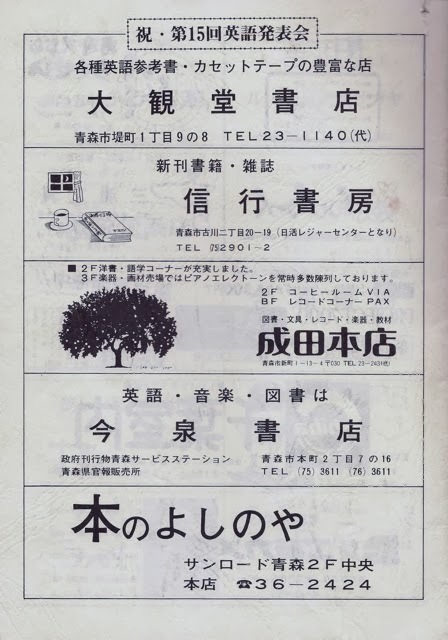 Information about the presentation can be seen on this post. 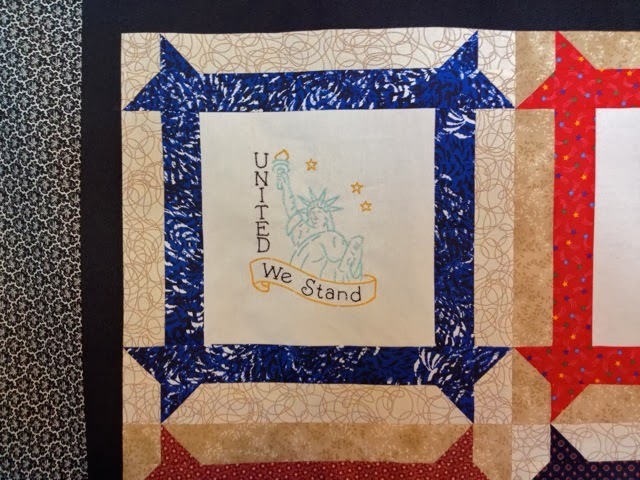 Thanks to Sue for making this Quilt of Valor possible. You may remember Jamie and her giant knitting needles as I have posted about them earlier in two separate posts - here and here. 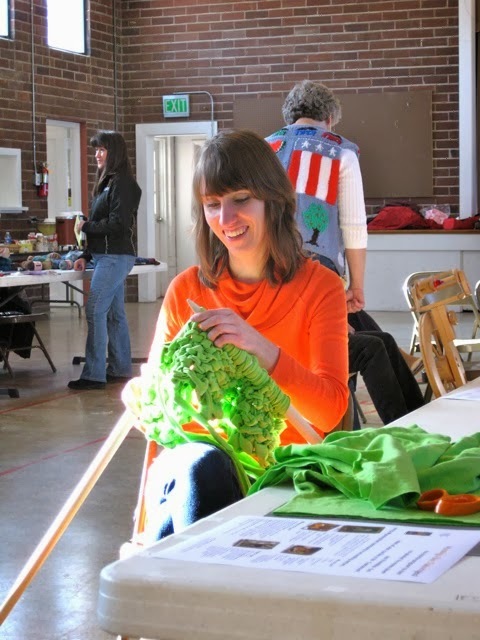 At Saturday's Fiber Guild meeting, Jamie revealed the finished rug during Show and Tell. The rug "yarn" was made from old, promotional T-shirts. Those who have knit with T-shirt yarn know that it is heavy and awkward to handle. I applaud Jamie for working with the heavy material AND the large, heavy needles to create this rug. 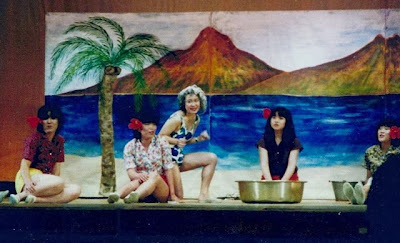 I had the opportunity to attend a couple of plays at Akenohoshi Junior College. 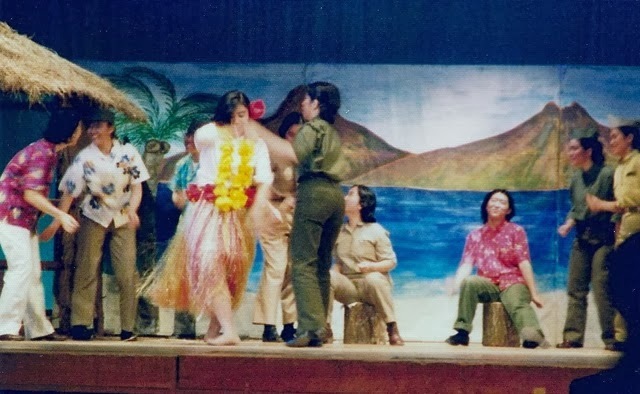 The plays were staged in English and a project for the students in the English Department. 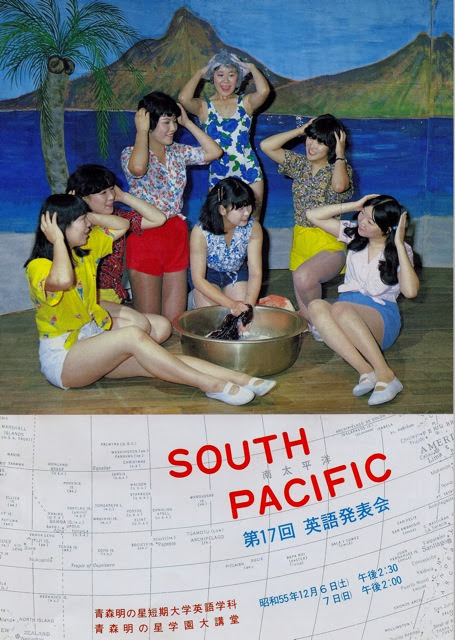 Before going to Japan, I had directed South Pacific in Wheatland, WY. It is a fun musical to direct, and seeing it performed in Japan was a treat. 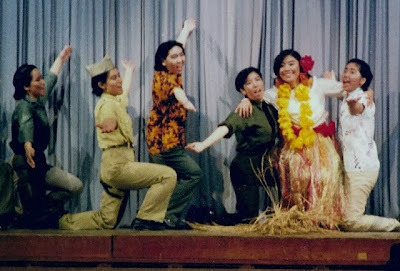 However, I thought it ironic the Japanese junior college selected South Pacific for their final project, as the play takes place during World War II and has several references to the Japanese military movements and battles. The all-girl cast did a fabulous job, especially with the numerous male roles. It was clear the girls were having fun. I thought it was interesting and clever to use a thin polyester batting for the "soap" in the number "I'm Going to Wash That Man Right Out of My Hair." 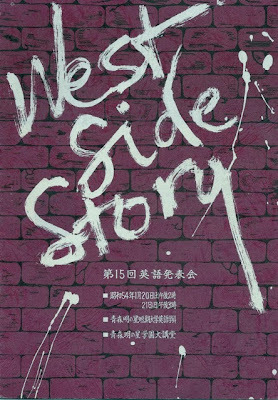 The school also presented West Side Story and Pride and Prejudice. 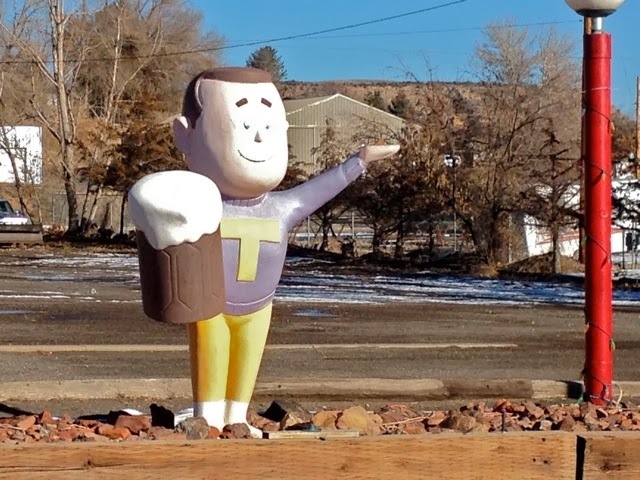 The A and W in Thermopolis has been closed for a long time, so I thought I'd better get photos of the "family" while I could. 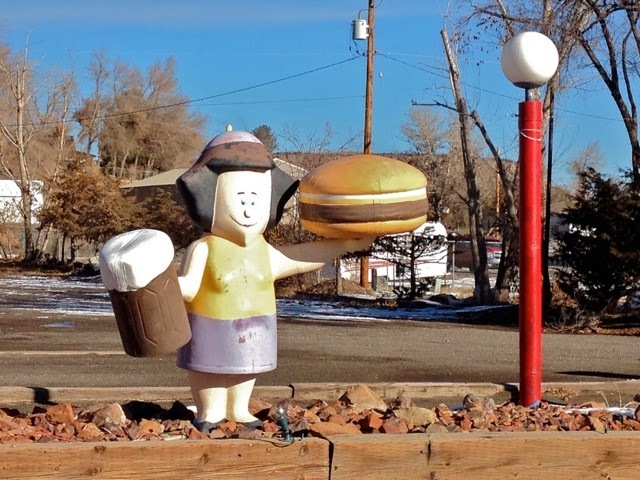 The statues once stood on the roof of the restaurant and bowling alley, and Baby Burger has been missing for several years. The iconic statues now have their feet on the ground, but I'm sure they will be removed when the property is sold. While most fast food places have a variety of specials, I'd be willing to bet that A and W was the first chain to introduce different sizes of burgers and or meals. The A and W Burger Family first appeared in 1963 when A and W introduced four choices of hamburgers and their corresponding Burger Family members: Papa Burger, Mama Burger, Baby Burger, and Teen Burger. These statues were produced for A and W by International Fiberglass. 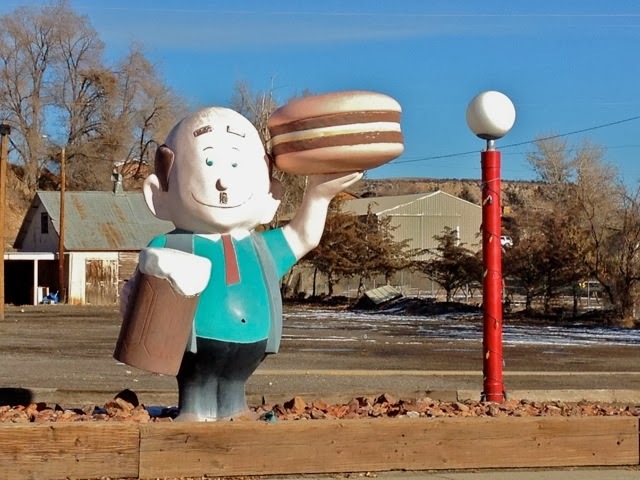 Papa Burger is 8 1/2 feet tall and his mug is 3 feet tall. A photo of the whole Burger Family on display in Oregon can be seen here. Do you remember the Burger Family? Are they still on display in your community? Whenever relatives visited, it was customary to line everyone up just before they left and snap photos. The photos document the visits of aunts, uncles, cousins, grandchildren, friends, and children. It was difficult for anyone to escape without having a photo taken. Obviously, Grandpa Eberle developed his aversion to cameras as he aged: I remember him running whenever a camera was visible. Dad looks pretty dapper in that hat; however, by the time I joined the family, he wore a fedora when visiting or going to town and a ball cap when working. Uncle Albert served in the Air Force during World War II, and he was stationed in England and worked in supply. For years, he worked at Ellsworth Air Force base near Rapid City, SD and lived with Grandpa Eberle until Grandpa died. 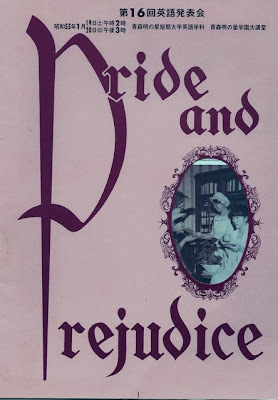 Albert married a divorcee (Helen) in the mid 1960s. My brothers called Albert "the preacher" because he gave unsolicited advice about nearly everything. Two of Albert's brothers also served during World War II; Buddie (Oscar), in the Air Force as a tail gunner and Jake (Jacob), in the Army in a tank unit. The oldest brother, Otto stayed home and worked on the ranch/farm. 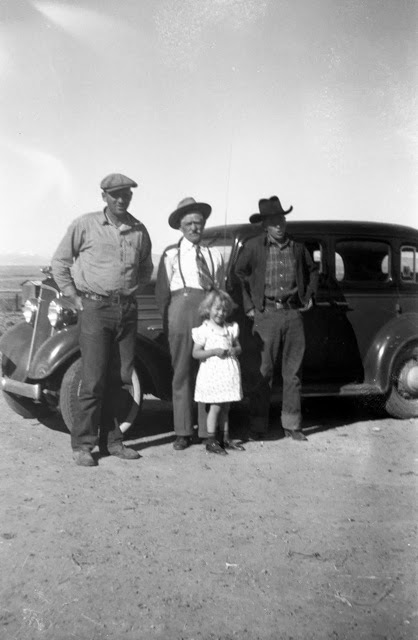 I can't begin to imagine how long the trip from South Dakota to central Wyoming took in the 1940s. I wonder what the roads were like and how fast they could drive. Do you remember taking photos of relatives when they said "Good-bye"? Do you still take photos of visitors before they leave? About a week ago, a friend called to ask a favor - to knit two baby hats. Since I was between projects, I accepted. 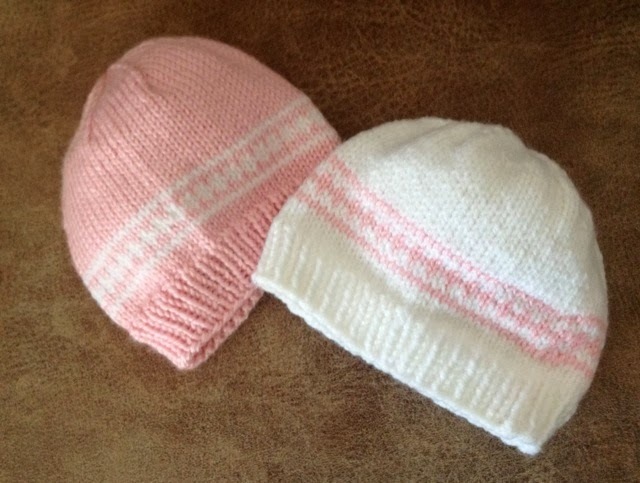 She wanted newborn hats - one pink, one white. I like the simple colorwork, which adds some interest to a basic hat. 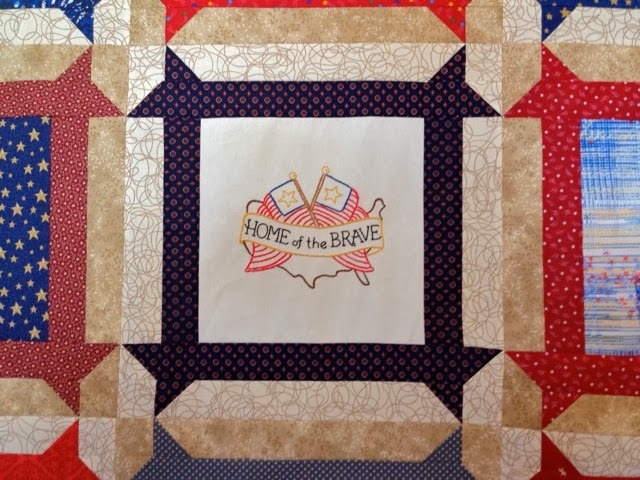 Mid-December, my friend Sue gave me 10 embroidered, patriotic blocks for a Quilt of Valor. 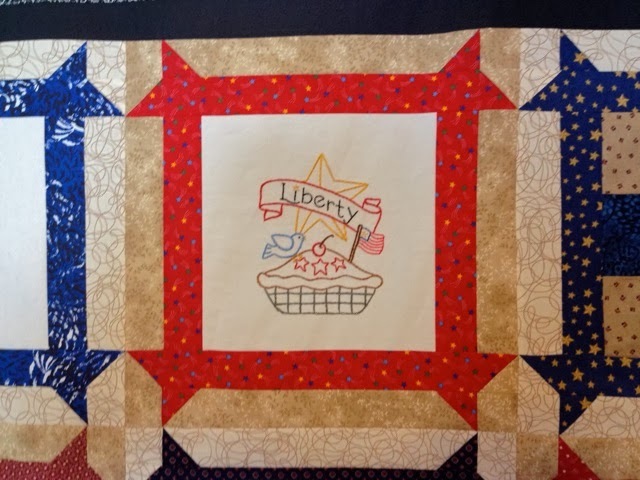 I decided on a pattern (Autumn Harmony by Benartex) and started working with Sue's blocks last week. 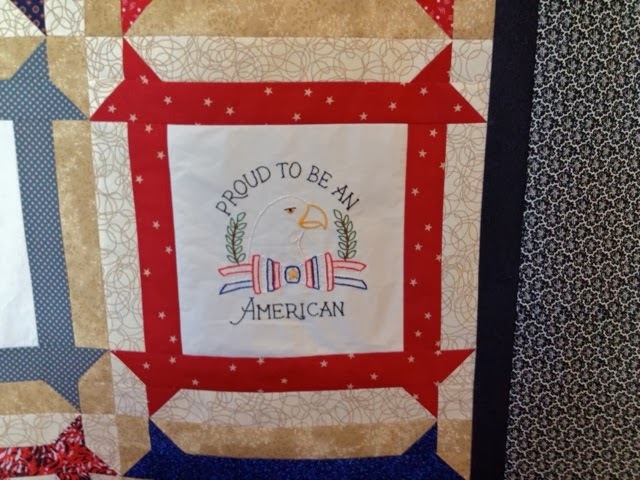 Since she had embroidered the blocks on large squares of fabric, I was able to select a pattern more easily. 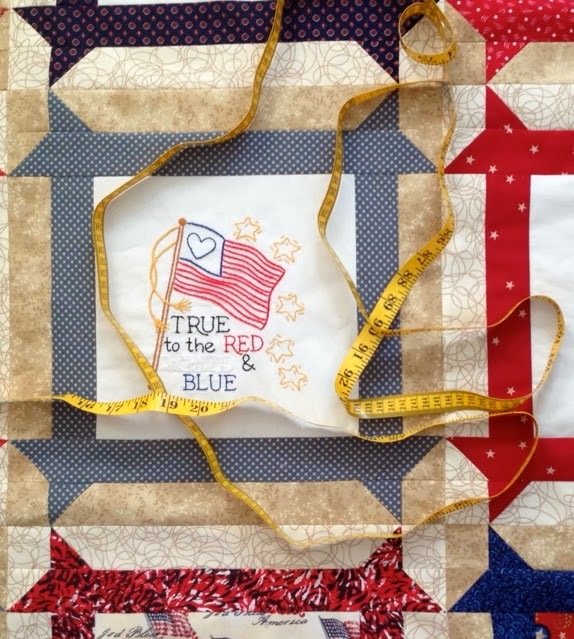 Thanks, Sue for helping me create a Quilt of Valor or maybe even two.